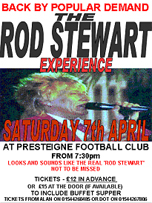 Break out your best leopard skin trousers and that long blonde wig you have had in the back of your wardrobe (Mr Chairman..) as ‘Rod Stewart’ will be in town. Well, the Rod Stewart Experience, anyway – one of the country’s top ‘Rod’ tribute acts will return to Llanandras Park on Saturday, 3 April. If past experiences are anything to go by, tickets for this event are sure to sell out quickly and you are advised to get in there early. These tickets are available from either the chairman, Alan Randell, or Dot Griffiths and they will cost you £12.00 in advance, or £15.00 on the door on the night. But it is being stressed that there are no guarantees there will be any tickets left on the night so you are advised to buy them in advance to avoid disappointment. There will be a buffet supper on offer and the evening is due to get underway at 7.30pm. The tickets are available from Alan on 01544 260485 or Dot Griffiths on 01544 267806.